If you are an observant reader of the Neopian Times, you have probably noticed the funny phrase in the top right corner of every page of the Times, just below the banner that reads "The Neopian Times". Sometimes it says "Sanity is forbidden," other times it invites the reader to "Come dance with the gypsies," and at other times hints that "White Weewoos don't exist *shift eyes. *" However, my favorite one of these funny phrases, and the one that inspired this article, proudly proclaims the Neopian Times to be "Neopia's Fill-in-the-blank News Source." Now, I have been reading the Neopian Times on a weekly basis for almost two years now, and while multiple-choice quizzes are a common feature in the Times, and I even remember seeing a crossword puzzle in the Times once, I haven't seen any articles in which the reader must fill in some blanks to complete the story. Yes, dear reader, the article you are currently reading is what I believe to be Neopia's first ever fill-in-the-blank news story. The rules are fairly simple: in the section of this article labeled "Part 1: The Blanks" is a numbered list. Your job is to come up with a Neopian word that fits each of the prompts given in this list. These numbered prompts correspond to the numbered blanks in the section labeled "Part 2: The Story." So what you, dear reader, need to do to complete this story is 1) come up with a word or phrase for each of the prompts in Part 1, and 2) fill in the blanks in Part 2 with the words you came up with in Part 1. To make this easier, I recommend you copy and paste this article into your favorite text editor (or, for those of you who prefer good old ink-on-dead-trees technology, print out this article and fill it in using a writing implement of your choice). Merhlana, my Cybunny, tested out this article for me, and I will be posting her version of it on her petpage after the Neopian Times goes live with this article, if you are interested. Disclaimer: This article is intended for entertainment purposes only. Please DO NOT fill in the blanks in this article and then submit it to the Neopian Times as your own work. Also, I apologize in advance to all the famous Neopians whose names may end up being used to fill in the blanks in this article. 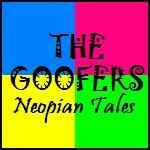 Hello and welcome to the Neopian News Network. I'm 1.__________________, filling in tonight for 2.__________________, who came down with a case of 3.__________________ earlier today while 4.__________________. In our top story tonight, 5.__________________ attempted to take over 6.__________________ today with an army of 7.__________________. The 8.__________________ were armed with 9.__________________, causing panic amongst the inhabitants of 10.__________________. Fortunately, before 11.__________________ could do more than destroy a 12.__________________, 13.__________________ came to rescue 14.__________________ from the evil menace. By 15.__________________, 16.__________________ had defeated 17.__________________ and his/her army of 18.__________________, thus saving 19.__________________ from total destruction. For his/her valiant efforts, the citizens of 20.__________________ presented 21.__________________ with a 22.__________________, in gratitude for saving them from 23.__________________. In other news, the ruler of 24.__________________ held a press conference today to say that he/she will be stepping down as ruler, effective immediately. 25.__________________ named 26.__________________ as his/her successor. Neopians everywhere were 27.__________________ to here of this announcement, and some citizens of 28.__________________ declared that they would move to 29.__________________ if 30.__________________ does in fact become the ruler of 31.__________________. In financial news, the Neodaq dropped 32.__________________ points today to close at 33.__________________. 34.__________________ was the biggest loser, dropping 35.__________________ points over the course of the day, to close at 36.__________________ neopoints a share. Analysts are predicting a brisk trading day tomorrow, as 37.__________________ plans to release its new line of 38.__________________ at the start of business tomorrow. On a somewhat related note, the Defenders of Neopia today arrested 39.__________________ in connection with the robbery at 40.__________________ which we reported on yesterday. According to Judge Hog, 41.__________________ was seen by several witnesses exiting 42.__________________ at the time of the robbery, carrying a/an 43.__________________ sack and wearing a long 44.__________________ cloak. Renowned thief Hanso, head of the Neopian Wealth Acquisition and Redistribution Foundation, firmly denied that 45.__________________ had any connection with his organization, and also denied any involvement whatsoever in the theft of several expensive 46.__________________ from 47.__________________, which was discovered earlier today. 48.__________________ could not be reached for comment. In Neopia Central, riots broke out at the Soup Kitchen this morning when a/an 49.__________________ discovered a/an 50.__________________ floating in his bowl of soup. The Soup Faerie has allegedly fled to 51.__________________ to avoid the rioters, and could not be reached for comment. The spokesfaerie for the Royal Palace in Faerieland has issued a 52.__________________ urging Neopians not to 53.__________________, and promising that the Soup Kitchen will reopen no later than 54.__________________. Now onto our sports coverage. 55.__________________ lost spectacularly to 56.__________________ in an off-season Yooyuball match today, prompting team captain 57.__________________ to announce that they would be trading 58.__________________ to 59.__________________ in exchange for a/an 60.__________________. No word yet on how this will affect 61.__________________'s chances in the next Altador Cup. Also in sports, today's Gormball match ended in an uproar when it was discovered that 62.__________________ had rigged the Gormball to always 63.__________________ after 64.__________________ seconds. No word yet on whether 65.__________________ will be allowed to 66.__________________ after today's disastrous match. Time for our on-the-hour weather report. 67.__________________ experienced a rain of 68.__________________ today, causing the inhabitants to 69.__________________. Tomorrow should be much as usual, with only a slight chance of 70.__________________ showers in greater downtown 71.__________________. We close tonight with these words from the Island Mystic: Never meddle in the affairs of 72.__________________, for you are 73.__________________ and good with 74.__________________. Good night, and may the 75.__________________ be with you! Kroost turned around to the dark figure in the trees. "Count Von Roo!" yelled Kroost. Dedicated to every uninspired person who dreams of getting into the NT, Story Contest or Poetry Contest. Terror Mountain: Where snow falls eternally.